Apple held its 2017 media event at its new Apple Park Campus where it unveiled the iPhone 8, iPhone X, Apple TV 4K and Apple Watch Series 3 with LTE. Every time this year, Apple gathers the world’s technology press to unveil new versions of its flagship products. This year was particularly exceptional, because it gave the press their first inside look at the new Apple Park Campus. Apple is currently phasing in employees to the new headquarters where new products will be developed going forward. The new campus features the Steve Jobs Theater, named in honor of the late Apple co-founder, known for his iconic product unveilings and stage presentations. Steve played a major role during the early design of the campus, too, and so it is a vision realized for the more than 12,000 employees who will work there. So, what did Apple unleash at the event? 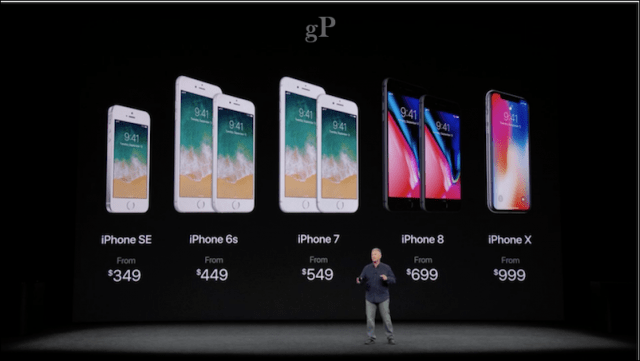 A lot actually: the Apple Watch 3 with cellular capabilities, 4K HDR Apple TV, iPhone 8 and iPhone 8 Plus and the much anticipated next generation iPhone X. Read on for more details and analysis. Today’s event started off on a reflective note, opening with a voice quote from the late Steve Jobs. 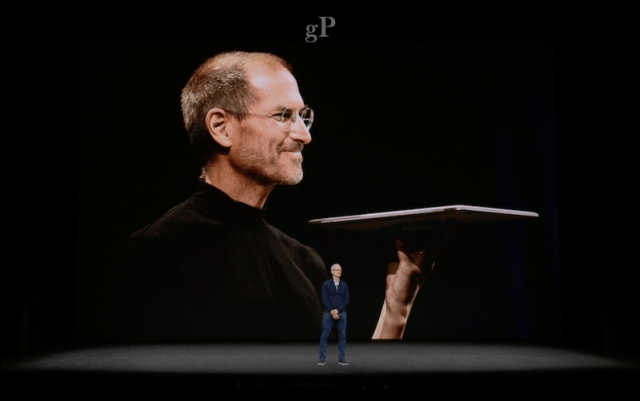 Tim Cook came out on stage expressing his thanks and gratitude for the contributions Steve made toward reshaping Apple since his return in 1997. It was bittersweet knowing he is not around to experience the finished work, but I must say, as with everything Apple does, it’s a beautiful theater on the outside. 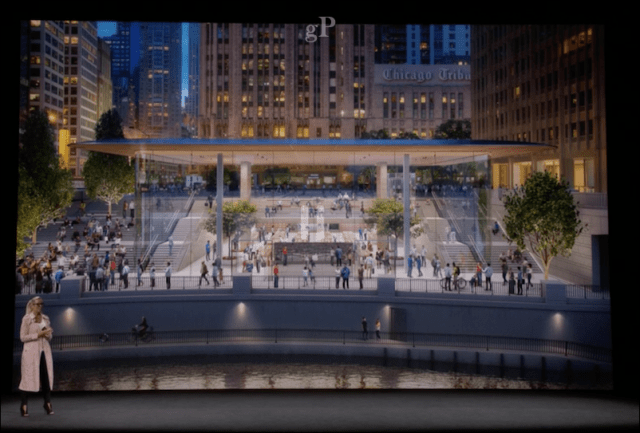 Apple will have a visitor center with included Apple Store where members of the public can visit to learn more about the new campus. First up was Angela Ahrendts, Apple’s Senior Vice President of Retail, who has reshaped Apple’s brick and mortar stores into new places not only for shopping but gathering to learn how to use Apple’s products. Angela described the differences in Apple Store appearances, first with the branding now embracing their locations. Stores feature specific experiences such as avenues for browsing Apple’s selection of products, town squares for meeting, and forums where you can get your Apple products diagnosed and fixed. Over 70 thousand employees now work at one of Apple’s retail locations. Angela expressed her thanks and appreciation for their contributions to building company’s success. Apple’s Jeff Williams (COO) was up next to show off the new Apple Watch Series 3. Apple has further moved the Apple Watch from its fashion accessory status to a more health focused one. Tim Cook noted Apple Watch has experienced a 50% increase sales and is now the number one watch in the world. That sounds like a death announcement to traditional time pieces like a Rolex, Omega or Movado. Apple says the Watch has received 97% customer satisfaction, which is astounding considering the device has taken a while to find its purpose since it was launched in September of 2014. 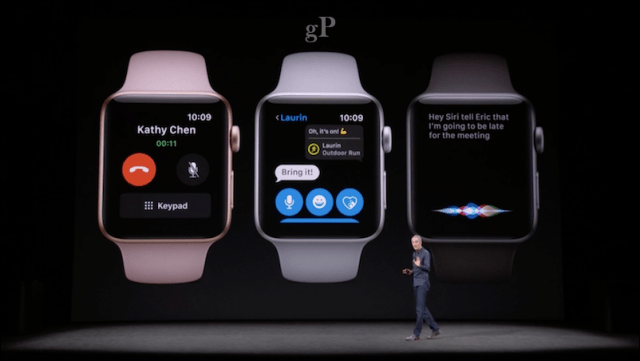 The most anticipated feature is now available with the Apple Watch Series 3 – the ability to send and receive calls. I see this as Apple’s awareness of the post iPhone world for many users. Not only can you make calls and read text messages, but you can stream up 40 million songs from your Apple Watch Series 3 using Apple Music over LTE or 3G. Apple was able to build a digital eSIM modem into the body of the watch, removing the need to have a dedicated SIM card. Series 3 will use the same number as your iPhone and require a plan to use with the phone. Apple Watch Series 3 features a 70% faster dual core processor, wireless Apple W3 chip (which supports the Apple AirPods) and a barometric altimeter. Jeff noted the Apple Watch is one of the most widely used heart rate monitors. New enhancements give users more information on the face of the watch using the raise to wake feature. The improved heart rate monitoring capabilities include better detection for elevated heart rate when you are not active. Apple has partnered with Standford University and the FDA through the Apple Heart Study to improve the heart rate rhythm detection, analysis and accuracy. Series 3 comes in the same colors and sizes as Series 2: 38mm and 42mm sizes in gold, silver or space gray aluminum, or silver or space black stainless steel. Other highlights include: Siri can now respond from the Apple Watch, 50% more power efficiency, and support for skiing and snowboarding. To accompany the launch will be a variety of cases and bands, including a new sport loop design and updates from Nike and Hermes. Of course, the new Series 3 with LTE will also be more expensive, starting at $399, while a Wi-Fi only model with GPS starts at $329 and will be available in Stores September 22. The Series 1 model introduced in 2015 will continue to be available 229. Availability will only be select regions such as United States, Australia, Canada, China, France, Germany, Japan, Puerto Rico, Switzerland, and the United Kingdom. All models will support the new WatchOS 4 available to existing models starting September 19. I have thought about getting an Apple Watch, particularly out of convenience. Recently, I tried using Microsoft’s ToDo to complete a shopping list at the supermarket, but it was so cumbersome. I eventually went back to a regular paper list. The Apple Watch Series 3 looks like a great way to not only do that, but also send and receive calls quickly and conveniently. Apple seems committed to the category and they are making an impact in the smartwatch market. I’m seeing it on more wrists than ever and the fact that it’s inspiring a lot of cheap knockoffs means it’s probably here to stay. One of the last to adapt the new display standard, Apple is jumping in with both feet when it comes to 4K. A new technology built into the Apple 4K TV is support for HDR, which stands for High Dynamic Range. This means more vivid colors, better contrast and support for a wider color gamut. 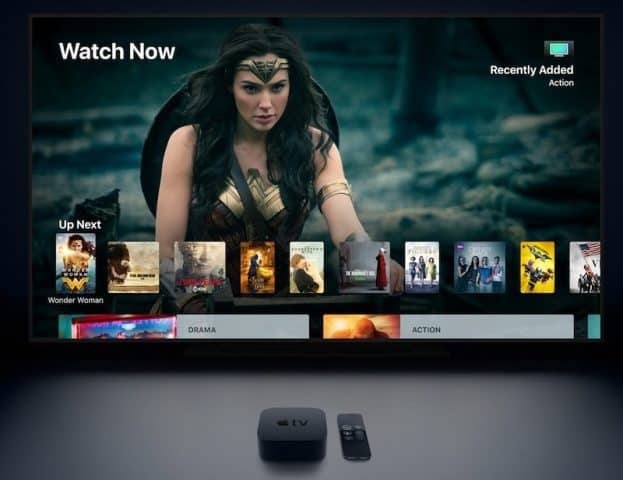 Apple’s Eddy Cue, Senior Vice President, Internet Software and Services, demonstrated some of the improvements in the new Apple TV. At the heart of the system, is a new A10x Fusion processor, the same processor found in Apple’s latest iPad Pro tablets. Apple says A10x Fusion processor in the 4K TV delivers up to two times the CPU performance and up to four times the GPU performance compared to the Apple TV. Eddy Cue said the price of 4K HDR movies on iTunes will be the same price as HD movies. If you already purchased high definition movies, don’t worry, they will be automatically upgraded to 4K HDR at no charge when you buy the new Apple TV. Third party services such as Netflix and Amazon Prime Video will also bring 4K HDR content to the Apple TV and a number of partnerships have been formed to bring local content to the Apple TV, too. Apple TV 4K will be available in 32 and 64 GB for $179 and $199 respectively. You can still get the older model for the same $149 price and the 1080p model now cost $99. Orders begin September 15th and you can purchase at the store September 22nd. Wait, what happened to the iPhone 7s? Apple thought they were becoming too predictable so they decided to switch things up a bit. The ‘S’ series over the years meant a lot of things: speed, Siri or it was representative of a tick-tock release. The iPhone 8 is surprisingly a major update. The chassis of the device features an improved design, sandwiched between a glass back and front; this could be a bit of inspiration from the iconic 2010 iPhone 4. The glass back is more than a design aesthetic though; but before we get into that, let’s talk about some of the tech that’s inside. The iPhones feature stereo speakers, providing richer sound quality. 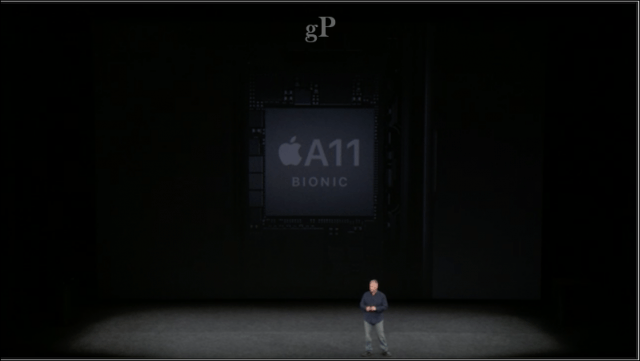 The heart of the iPhone 8 is the new A11 Bionic chip. So, Apple is taking the naming scheme seriously for its processors. The A11 is a six-core CPU (up from the A10 Fusions 4 core), includes up to 4.3 billion transistors. Apple says the performance cores are 25% faster than their A10 counterpart, while the four core high-efficiency cores are up to 70% faster than the A10 versions. Apple also designed a second generation performance controller which is also up to 70% faster in multi-threaded workloads. I can’t believe I’m writing this about a phone—these feeds and speeds make it sound like a super computer destined for your pocket. 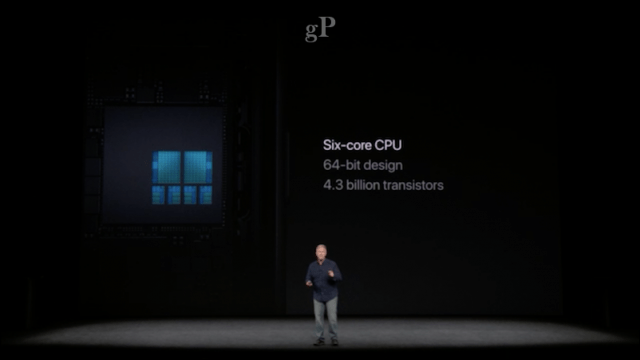 Apple didn’t stop at the processors either, the company unveiled for the first time, its very own GPU; which improves performance by 30 percent with half the power. There is not much new in terms of pixels for the camera, featuring the same 12 megapixels. 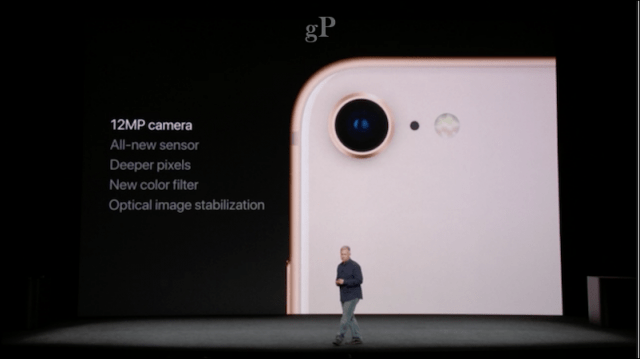 But Apple notes its an all new sensor, featuring deeper pixels, new color filter and OIS, which came to the standard iPhone 7 for the first time last year. The iPhone 8’s bigger brother, the Plus, includes two new sensors, both featuring f/1.8 and f/2.8 apertures. The new tech also includes an Apple developed video encoder that promises faster video frame rates, real-time image and motion analysis. Augmented reality is a big part of the new iPhone; the cameras are specifically designed for it. Improvements include better low-light and 60 fps, new gyro and accelerometer and accurate motion tracking. Going back to that glass back on the new iPhone 8, it’s there for a reason. The iPhone 8 will support wireless charging using the new Qi open wireless standard. 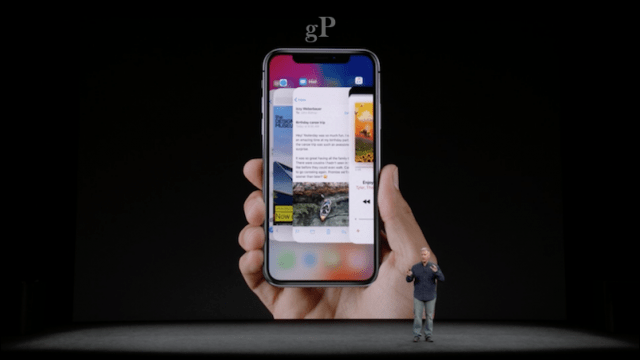 Apple is taking a different approach to wireless charging by partnering with a host of hardware vendors to support the iPhone. Apple hopes to push the ecosystem forward to the point where local businesses will feature wireless charging infrastructure and furniture. This answers a lot of questions about how convenient wireless charging will be if you still have to plug in a charging pad. Knowing Apple’s influence over the industry, working with an open standard and industry partners such as Mophie, it won’t be too long before you are able to leave behind your cable with confidence. Ten years ago, when I stayed at a hotel, they never had USB ports where you could plug in your devices and charge them, now it’s a standard at airports, fast food joints and hotels. So, this is something I’m looking forward to. 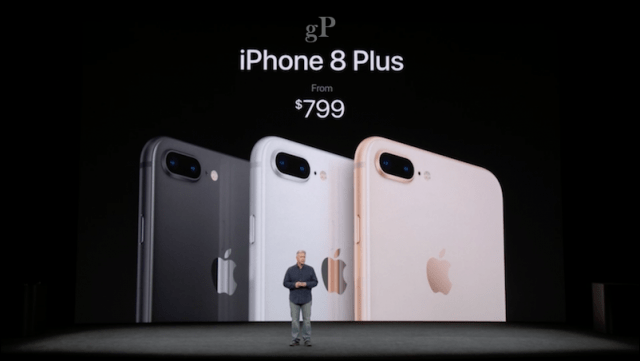 The iPhone 8 and iPhone 8 Plus include a whole lot more, but I would have to write a book to tell you about it. Some additional highlights include a new Portrait lighting feature similar to last years Portrait Mode (only available on the Plus model by the way). Portrait lighting lets you take studio quality photos. Again, AR plays a big role here, letting you add stunning effects to your photos for depth and contrast just by carouseling through a gallery of pre-defined filters. The feature will launch in beta, but should be available in the near future. 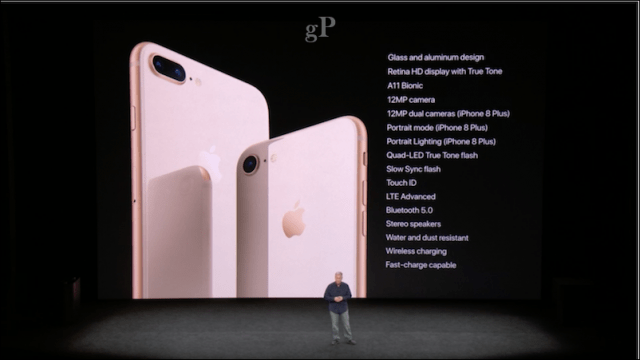 iPhone 8 features also Quad-LED True Tone Glad and slow sync flash. Other under the hood improvements include support for LTE Advance, Bluetooth 5.0, even more water and dust resistance and fast-charge, which Apple says can get you to 50% in 30 minutes. iPhone 8 will be available in three configurations, 32 GB, 128 GB and 256 GB and starts at $699. The Plus model will be available in the same storage configs, but starts at $799. 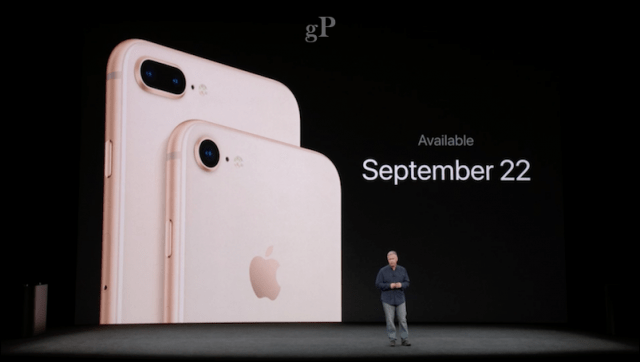 You can pick up the iPhone 8 on September 22nd. By the way, iOS 11 will be available on September 19th. The tech is impressive, but I have to say, I’m still happy with my 6s. It takes nice pictures and hasn’t slowed down much. After a couple years, I’m still learning about its many features. That’s a lot of money to part with, but I’m sure many will no matter what. Apple took a page from Microsoft today, by jumping from 8 to 10 in a single day. 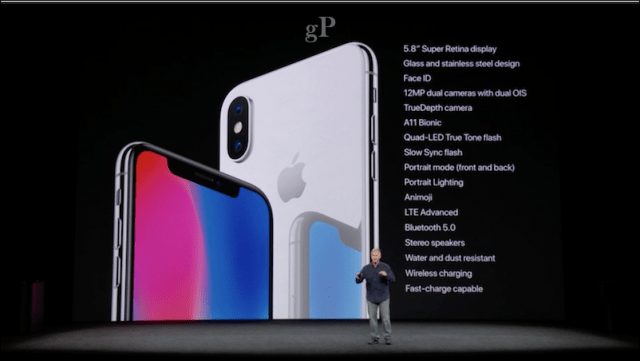 What is iPhone X (pronounced 10) all about? This is Apple’s preview of the future of smart phones – so they say. A lot of the anticipation for the iPhone X kind of went out the window over the weekend, when leaks appeared on Twitter about the new model. Not to mention, leaker’s have been previewing the new design for months now. So, it was a bit underwhelming, but the details still remained a mystery. 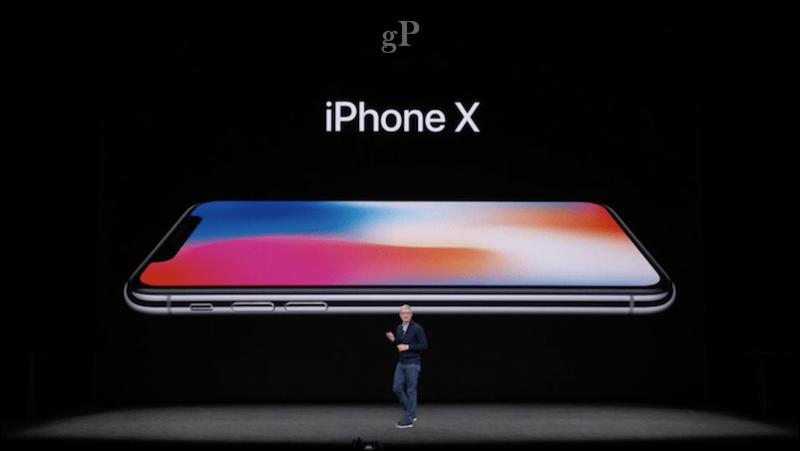 The iPhone X comes in a stunning design; featuring a glass and front back, held together by a stainless steel frame. but the new display tech is what stands out the most. For the first time ever, Apple brings an OLED display to the iPhone; calling it the Super Retina Display. 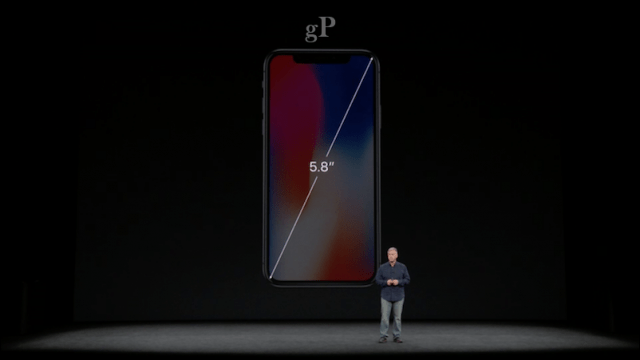 The dimensions of the phone feature a 5.8 diagonal screen, with a resolution of 2436 x 1125. Apple said bringing OLED to the iPhone had its pros and cons—these include: great contrast, high resolution and thinness. But the tradeoffs made it a deterrent: brightness issues, lack of support for wire color gamut and color accuracy. Apple was able to fix these issues before they engineered it into the new iPhone. 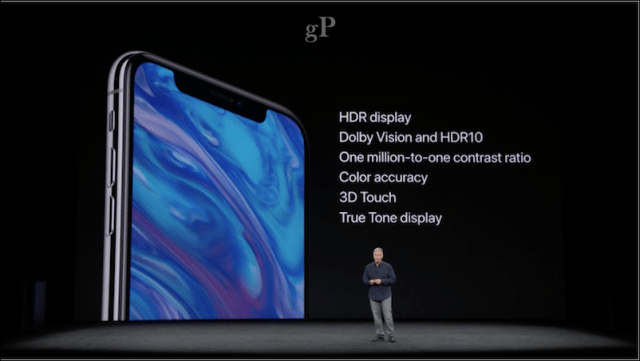 The display also includes some amazing tech such as HDR display; Dolby Vision and HDR10; one million-to-one contrast ratio, color accuracy and a true tone display, which originally debuted on the iPad Pro. The most surprising reveal was the lack of a Home button; the same iconic Home button that first made its debut in 2007. After 10 years, it has become second nature to using your iPhone. You use it to go to the Home screen, switch between apps, navigate apps, trigger Siri and even restart the device. Security has also been at the heart of the Home button. In 2013, the iPhone 5s introduced Touch ID with the secure enclave which made it easy to securely unlock your iPhone. So, what is Apple doing to replace these critical components? 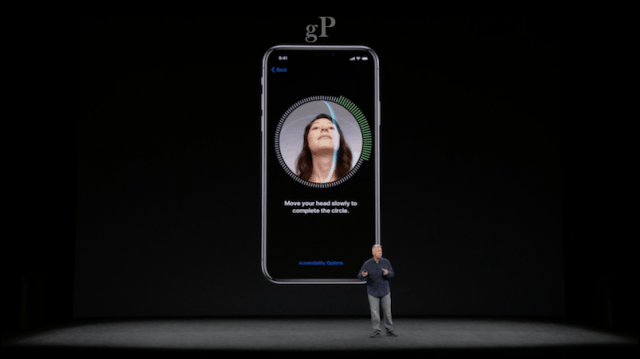 The iPhone X uses a combination of facial recognition called Face ID and gesture based interaction. 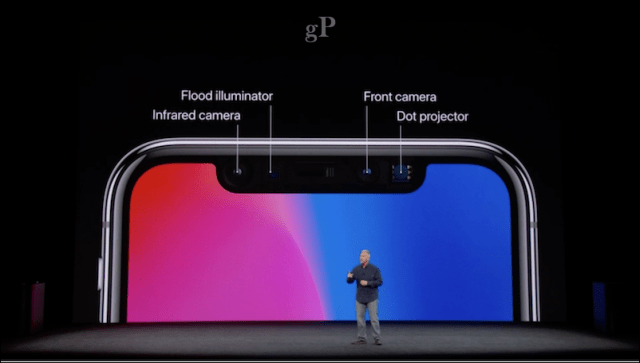 The new camera system built into iPhone X called the TrueDepth camera system includes a laundry list of sensors: infrared camera, flood illuminator, proximity sense, ambient light sensor, speaker, microphone, front camera and dot projector. The four critical technologies: infrared camera, flood illuminator, front camera and dot projector all work together to authenticate your face. But, how exactly is this being done? The new iPhone includes a facial enrollment system similar to touch ID. The demo showed it was easy and quick to set up by simply requiring that you move your head slowly to complete a circle. The phone captures the contour and depth of your face using over 30 thousand points that make up for a unique identity. This is part of the neural networks using deep learning Apple has been investing in over the years; and it’s part of the technology that differentiates the iPhone X’s new camera system and A11 Bionic processor. It actually is learning about you each time you use the phone. Just like Touch ID, your face data is protected by the secure enclave, where all local processing is done. This means, your face is required to unlock your phone and the chances of someone with a similar face unlocking your phone is one in a million. Users don’t have to worry if they grow a beard, mustache, change hair color, wear glasses; or try to fool it as in Samsungs case, by taking a printed picture or create a wax figure doppelganger. Face ID won’t unlock it unless it’s you. Then again, it might be too secure and there are still some unknowns. Apple’s Craig Federighi, senior vice president of Software Engineering, came out on stage to demo the feature, but the first demo iPhone X didn’t unlock on command. Fortunately, it did on the second demo unit. It also revealed that users will still be able to use a passcode to open the device if needed. The iPhone X is mostly gesture based when navigating the interface. For instance, to go back to the home screen, users will use a software based bar at the bottom of the screen to go back to the home screen from any app. If you want to switch between apps, you swipe an app up for a split second and other running apps are shown as a deck of cards. Accessing notifications and Control Center is now done from the left and right top notches. 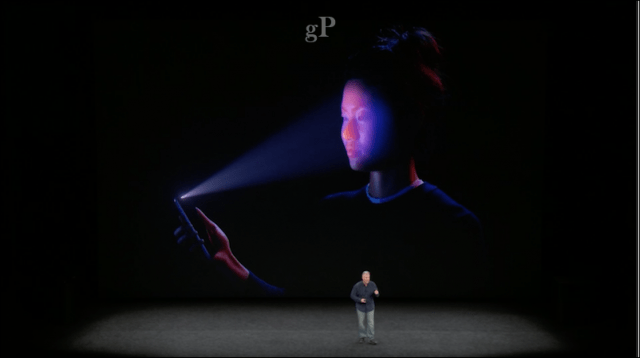 Users will be able to make payments by using Face ID then using the sleep and wake button to confirm. This can also be used to call up Siri. 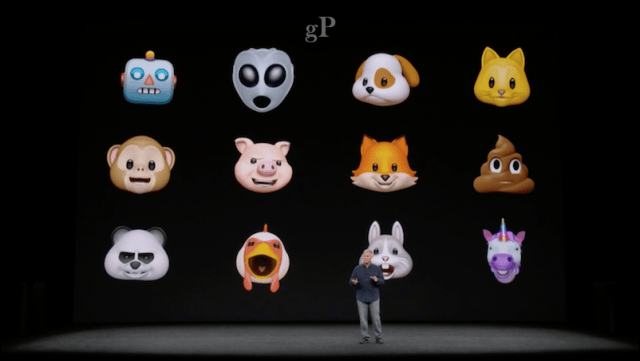 iPhone X includes new emoji’s for messages called Animoji’s, which use your recorded facial gestures to be animated by a set of built in characters: robot, alien, puppy, cat, monkey, pig, fox, poop, panda bear, chicken, rabbit and a unicorn. Users will find all the camera tech found in the iPhone 8 in iPhone X, along with larger and faster sensors, color filters and deeper pixels. Both the front and back cameras support Portrait mode and Quad-LED True Tone flash. 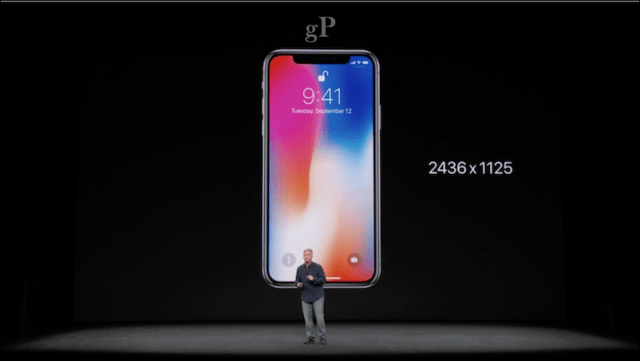 iPhone X will come in two configurations, 64 and 256 GBs starting at an astounding $999. Just to clarify, if you want the 256 GB model, you need to spend up to $1,150. I never thought I’d see the day when an iPhone cost more than some of Apple’s own computers. Customers can start taking pre-orders come October 27th with general availability November 3rd. So, it’s a long wait to get your hands on one if you are interested. Apple is still selling older model iPhones, so, if you are not ready to part with a lot of cash, you can still get an iPhone SE, 6s or iPhone 7, which now starts at $549. It’s a lot to process, but there it is, after one whole year of speculations, leaks and predictions, the new iPhones. The other days announcements are cool additions, too: the new Apple 4K TV; Apple Watch Series 3 with cellular; and new wireless technologies from both Apple and industry partners. If you are an Apple enthusiast, it’s gonna be an expensive winter. I’m interested in hearing your thoughts about today’s events. Are you iPhone or Android user; do you plan on switching or holding firm?